Hi there, Ilaria here. I’ve only lived through one European winter, in France, when I was 19. The snow was thick and soft, the temperature a fairly consistent zero degrees, and the days were surprisingly beautiful! This is coming from someone who’s used to a summery festive season with outdoor barbecues and New Year’s Eve beach runs. Fast forward a few years and I’m back in the Northern Hemisphere fighting off the cold while settling in to a grey, drizzly London winter. Over the summer I’d loved going to the markets bringing back hoards of fresh produce from all over town. These days it gets dark at 4pm so upon finishing work an hour later, I’m straight home, B-line to the kitchen, and ramping up the oven to 180 degrees. This isn’t just an expensive way of heating the house (hehe) but also the basis of what has been my dinners for the past few weeks. I’ve done my dash with soup (I’d previously made huge pots of stewwy goodness nearly every night for a month! ), and I’ve found meat here to be generally pricey, so the newfound staple? 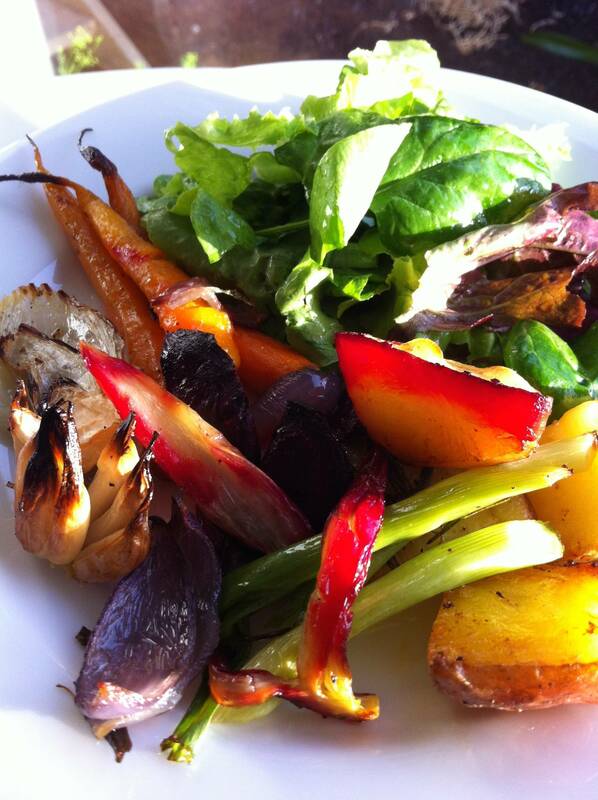 Roast veggies. Lots and lots of roast veggies. I’ve never liked the idea of eating meat that wasn’t free range or organic and unfortunately where I’m living at the moment, buying this sort of produce is pretty expensive. I’ve got into the habit of eating meat out at restaurants instead and keeping the protein intake at home to fish, tofu and eggs, which works pretty well as all are quick and easy to cook. I always have a decent supply of potatoes (must be the Irishness from mum), garlic and ginger, so all these are the mainstay ingredients in my roast veggie trays. As I’m usually in such a rush to get home, I’ll stop at the mini supermarket store en route and grab whatever other fresh and reasonably priced veggies I can find to add to the tray (not as easy as it seems; I’ve seen some individual £1 kiwifruit…!) I’ll toss veggies together with just enough extra virgin olive oil to coat them, fresh thyme, crushed garlic, ginger and salt and pepper, and then sprinkle a little cinnamon over chopped carrots if they’re in. Naturally, some veggies cook quicker than others but I don’t mind – while the pumpkin is soft and the ‘tatoes are fudgey, the broccoli can get quite crispy. Once out of the oven I’ll toss the veggies with sliced cherry tomatoes for some juice and baby spinach leaves (the leaves wilt from the steam and bring the veggies together) then sprinkle, or excessively DUMP, a huge amount of parmesan cheese on top! It quickly melts into a delicious oozy pile of decadent goodness, and after minimal effort, Bob’s your uncle. Feel free to skip the cheese part if you want, or swap it for crumbled goat’s cheese or put feta on top instead. Either way, you can’t exactly go wrong with a huge tray of roast veggies – jazz it up and make it the main event for dinner, and the next day, fry up what’s left! The day this came through from Ilaria the temperature had dropped several degrees in Auckland (Bah! What about our summer!). I felt the cold nipping at my ankles most of the day, and you know what? 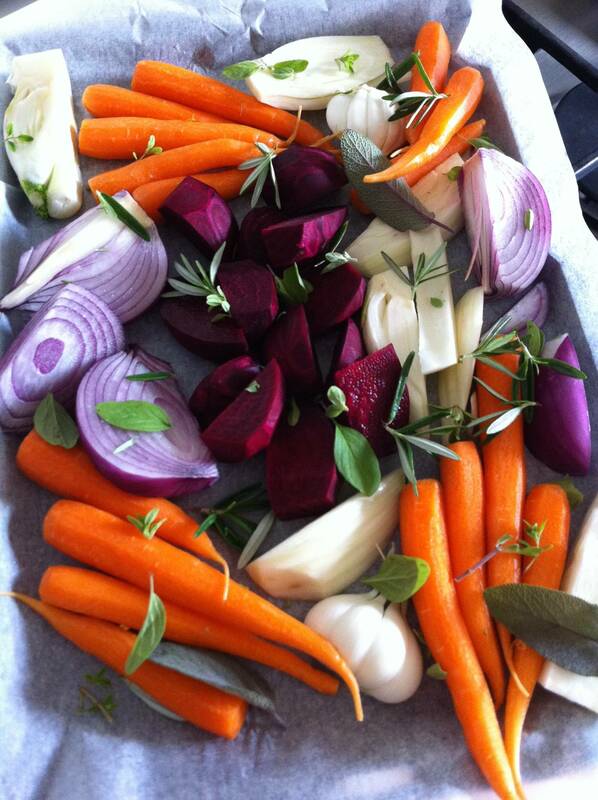 Come 6.00pm I found myself chopping up an assortment of vegetables and making a tray bake of vege. It’s catchy! These were gorgeous, drizzled with extra virgin olive oil, and with added rosemary, thyme, marjoram and sage, simply because I had them all growing. I’d say, no matter what the season, you can’t go wrong with a tray of baked vegetables and a salad. Colour, crunch and good taste, and good for you. Yep, you can pig out on a tray of baked vegetables.